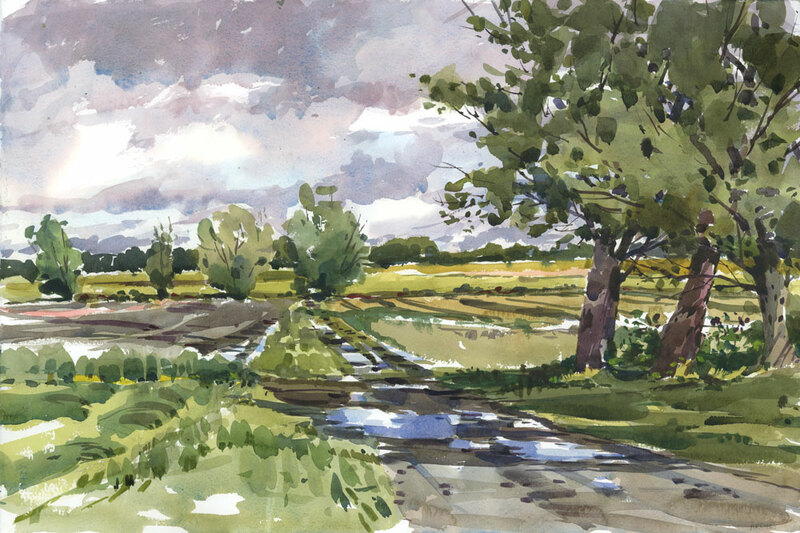 I’ve been waiting for a good day to get out and paint some large size landscapes, and since the forecast was favourable this morning I drove out to McGill’s Macdonald Farm, car loaded with jugs of water, my French easel and some half sheets of watercolour paper. I managed to get two done in about four hours, and that felt pretty good. The intention with these was to capture the feeling of the day — nothing too polished — more like really big, loose sketches on large paper. It was quite freeing to splash around on the paper. I didn’t even tape the sheets, just clipped them with bulldog clips at the corners and let them be. I wanted the paper to feel as free as I did, if that makes any sense. 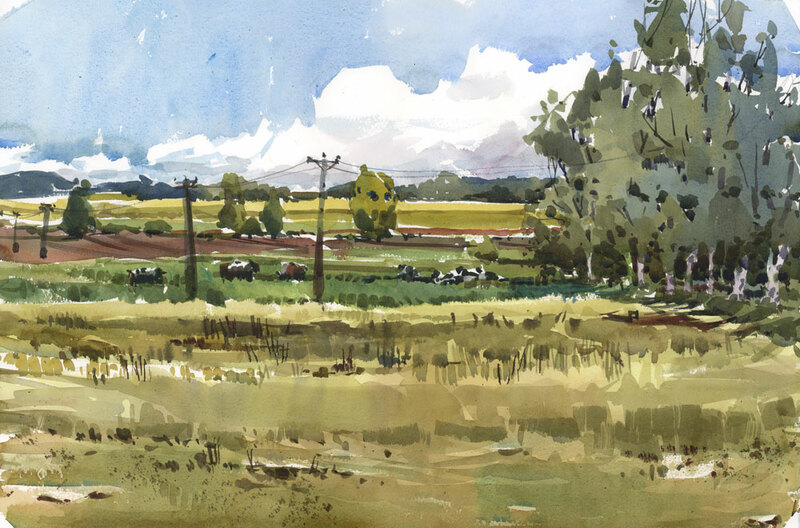 The first painting was done at the end of a farm road where I paint often. I was really looking for a scene with some distance and depth, and these fields are more interesting in the spring before the corn comes up and there are still some unplanted areas. The sky was quite dramatic because of the unsettled weather that we’re having in Montreal this week. I tried to capture a bit of the turbulence in the clouds but wish I hadn’t gone back in with a second pass of wash on the sky. Skies in watercolour are always better when you can paint them all in one fresh wash. I am happier with the way the sky came out on the second sheet I did. I didn’t make the same mistake of going back into the sky and this one retained its freshness. The cows were in the field so I added them in, although I’ve never painted cows before. The ones grazing move around more than I expected, and by the time I was ready to paint them they were all having a rest in the shade. I haven’t painted on half sheets of watercolour in a long time. I find the format is often too wide for my compositions, but for open landscapes this size is ideal. Painted on Arches Cold Press 140 lb, 22″ x 15″. Most of today was spent doing stuff in the garden but I took a break at midday to paint some of the flowers blooming right now. I get through winter by bringing home grocery store bouquets of flowers that are perfectly cultivated and unfortunately, often all the same size. In summer I can’t wait to pick a handful of randomness from my own garden. All flowers are beautiful in different ways, even the ones we think of as weeds, but Bleeding Hearts are my spring favourites. It’s the way the pink blooms hang from the arching stems, and the way they delicately open to reveal their white centres. And of course what makes them fascinating to look at is also what makes them irresistible to draw. Painted on Fabriano Bright White paper, 10″ x 14″. 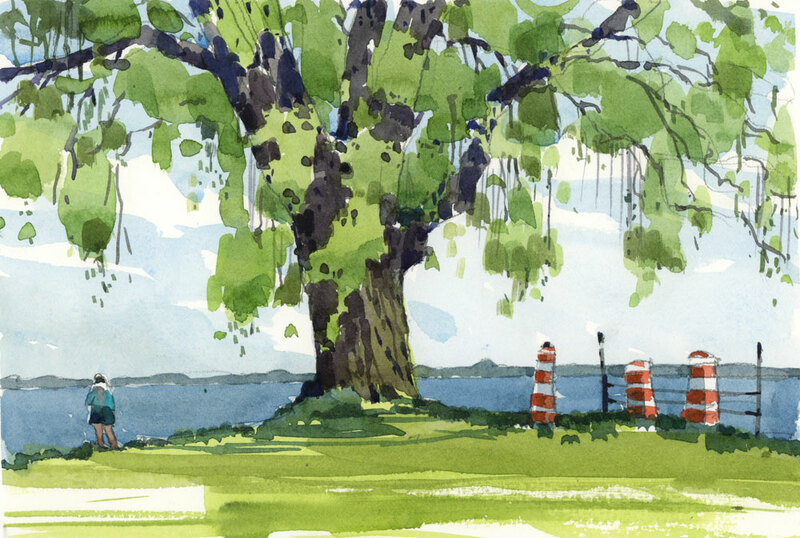 The pond next to City Hall in Baie d’Urfé is one of my favourite places to paint. Even though it’s situated fairly close to a busy road and a noisy bus stop, when I paint there I hear nothing of the traffic going by. My brain tunes out everything except the call of the red-winged Blackbirds and the burbling of the water. A little oasis, really. It’s not a huge pond but there’s a little stream that leads from one pool to another, a spot under the trees for my easel, and a fountain in case I run out of painting water. Painted wet-in-wet on Arches paper, 15″ x 11″. I’m so excited to announce that my first online Craftsy class “Sketching Landscapes in Pen, Ink & Watercolour” is now out on DVD. I have been asked many times for this by people who have slower internet connections or can’t watch online courses for one reason or another. 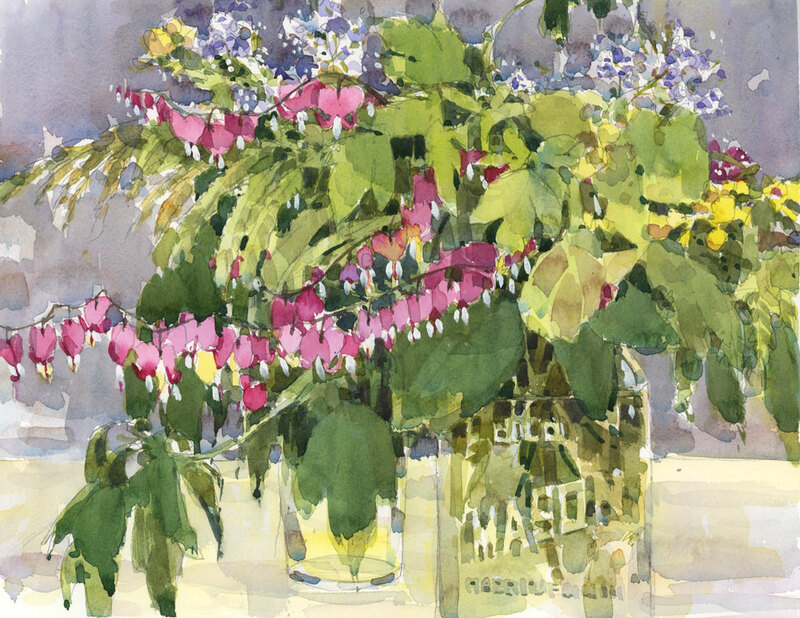 This DVD is the exact same course content as the online version, broken up into seven convenient lessons and including all my tips and techniques for composition, painting skies, drawing with pen and ink, and painting with quick watercolour washes. 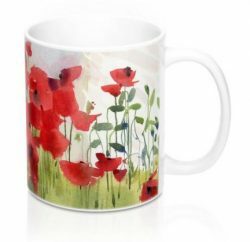 For blog readers, click here for a 25% off coupon. 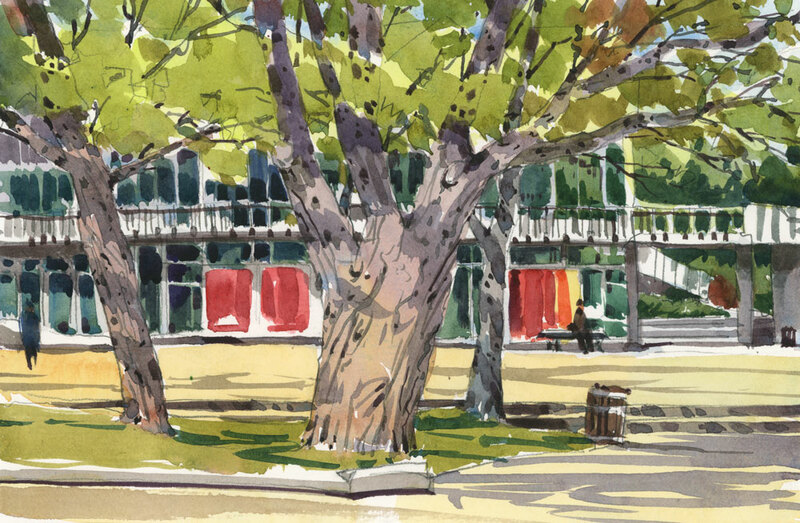 And watch for a June launch of my other online class “Sketching the City in Pen, Ink and Watercolour” on DVD too! I’ve painted lots of fruit but this may be a first for cherries. These were great fun to paint because when you look carefully at each one you see so many colours. The lightest ones go from red to orange and others are so dark that I had to mix up a black from Alizarin and Phthalo Green to obtain the intensity I wanted. The fruit also picks up little bounces of light from the plate so in some places I tried to give a hint of that too. 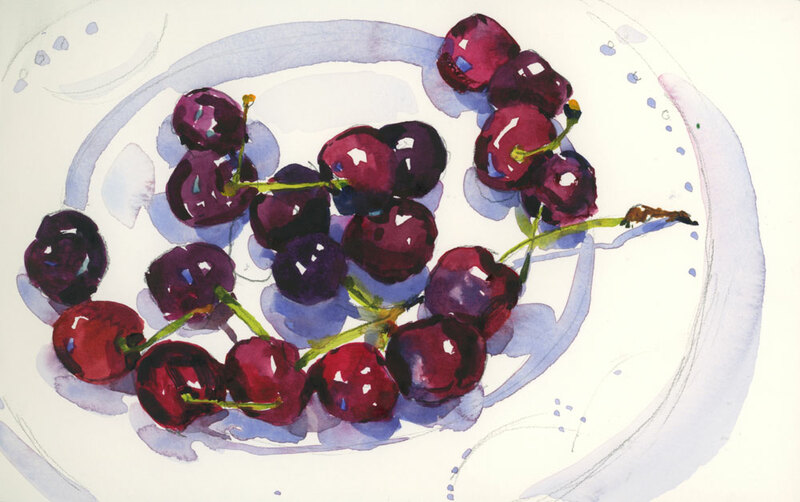 When I paint something this dark I aim for a deep colour to start with, in this case Permanent Alizarin Crimson, Quinacridone Rose, Ultramarine Blue and Phthalo Blue, with a little yellow to warm up a few of the fruit. If you want clean colour, you don’t want to paint this in too many layers because you’ll lose the freshness of the paint. 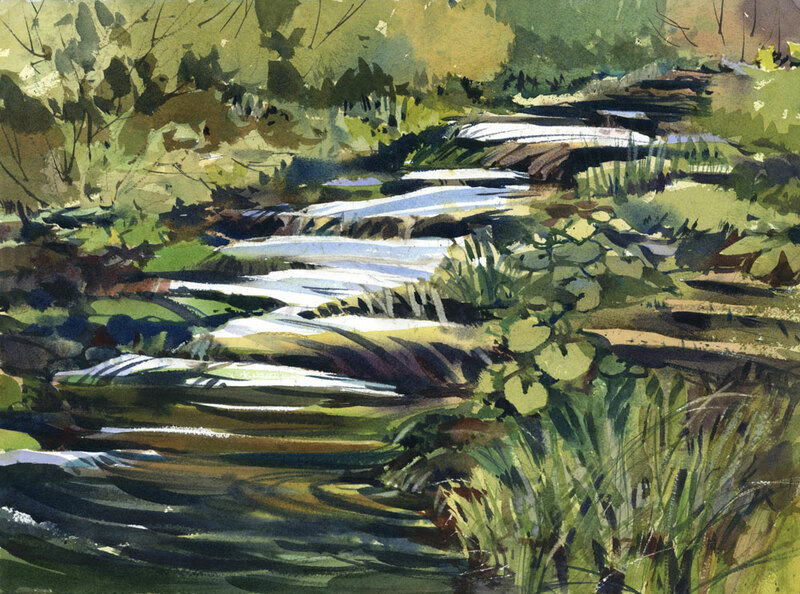 Sketched in a Handbook Watercolour Journal, 5.5″ x 8.5″. Thanks to Les Amis de la Montagne for inviting Urban Sketchers Montreal to enjoy the third annual day of sketching in Mount Royal Park. There’s always so many things to draw on the mountain, especially on the weekend. The morning started off pretty quiet with hardly a soul in sight when I sketched the pavilion at Beaver Lake. At the last minute I added in a few figures so it wouldn’t look completely deserted. In the afternoon things got a little more lively in the park. Entire families arrived with coolers of food, bags of charcoal and kids in tow. Soon the air was filled with the aroma of grilling meat. 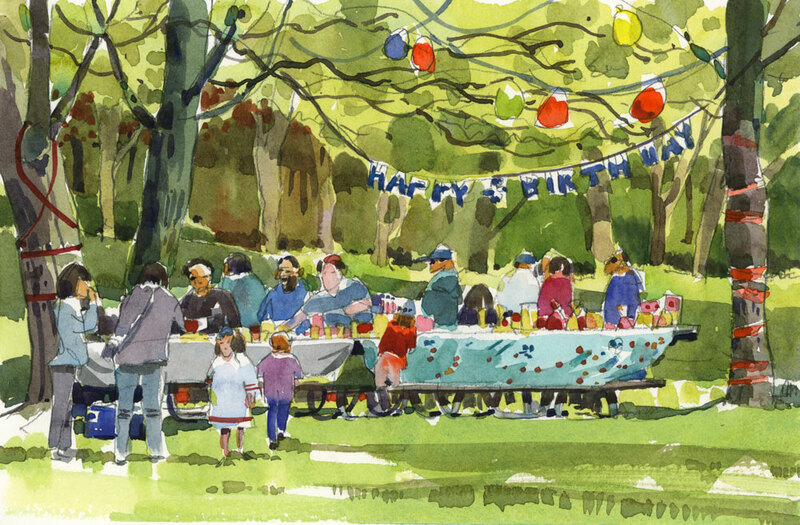 We were headed up to the lookout to paint a panorama of the city but stopped in our tracks when we saw the birthday party under the trees. Who can resist the balloons, the ribbons, the party favours and loot bags? With a scene like this the hardest part for me is the figures, so I just jumped right in and drew those first. I’m not used to drawing children so I started with the little girl in the white dress and moved on from there. The day ended with a nearby family offering our group of sketchers a plate of food from their table. Can’t get much better than this on a Sunday in the park. The middle of May is usually an exciting time because that’s when the boats around here go in the water. But this is an unusual year, with all the flooding around Quebec, and the water levels at record highs in Lac St. Louis. The other evening I went down to check out the area around the Pointe Claire Yacht Club to see what was happening. The road leading to the club is closed to vehicles but you can walk down towards the lake. I was shocked to see the water up so high that the parking lot where I often paint is submerged. In fact, the waves were so inviting in the lot that my dog wanted to go for a swim. Today, I went down to the lake again to see if I could see the Yacht Club from the park nearby. There seems to be lots of movement on the grounds of the club — I guess just a bunch of sailors working on their boats and itching to launch them. I tried to get an ETA on launch day from one boat owner who stopped to look at my sketch. He nodded his head slowly and said, “Not anytime soon…”. Instead I sketched the orange cones and the people who came down to the water to stand on the shoreline and fish.